This cable conductor tester is used to establish a two-conductor voice connection from the beginning of a cable to the end, or to any place where the individual conductors are accessible (such as cable sleeves or junction boxes). In addition to duplex communication, with the third conductor (test conductor) connection tests can be performed between the two places. Connections are indicated immediately, both optically and acoustically without delay. It does not matter if the voice lines are unconnected or connected telecommunication lines, if terminal devices are connected or not. Short circuits, ground faults, interruptions and swaps can be located, depending on the termination technique used. A transmitter is built in, which can be activated at either side. This transmitter makes it easy to quickly find the voice conductor pair on the other side. 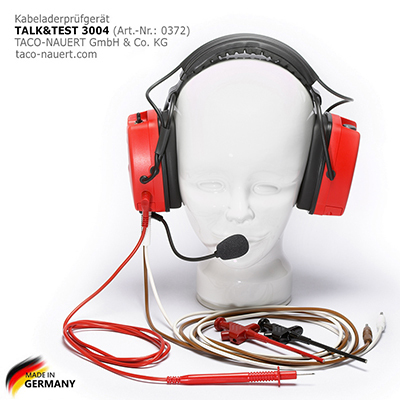 The TALK&TEST 3004 can be used in conjunction with test headphones to follow leads. 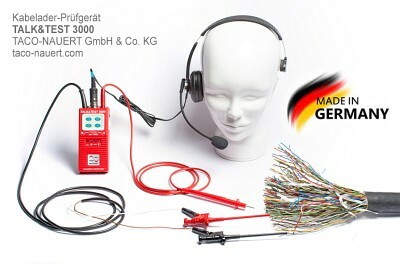 This cable conductor tester is used to establish a two-conductor voice connection. From the beginning to the end of the cable, or to any random position such as to bushings or to terminal blocks where the conductors can be accessed. In addition to far-end crosstalk, connection tests can be performed between the two positions with the third conductor (test conductor). Connections are indicated immediately (optically and acoustically), without delay. 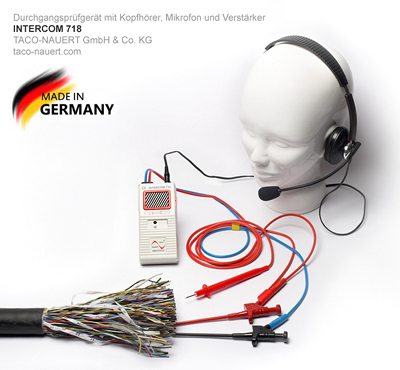 It does not matter if the voice conductors are unconnected or connected telecommunications lines, if terminal equipment is connected or not. Short circuits, shorts to ground, broken conductors and swapped conductors can be localized. The voice conductor pair at the remote end is easily found with the built-in signal transmitter (which can be enabled at any end).